Have you noticed how the news media is working overtime to relay Department of Defense press releases about the dangers of chemical and biological warfare within US borders - in the absense of any credible threat of such an attack? And how localities are receiving generous funds to train in "defense" against the same? All this is being treated as a new phenomenon. It's not. Over half a century ago, there were two countries in Europe that were keenly interested in similar training programs. 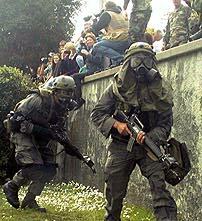 And they ended up using the gas against their own countrymen. "Everyone's doing is but us! 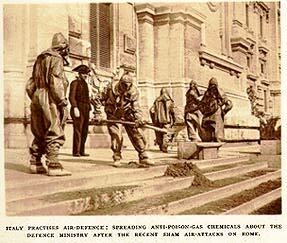 - Civilians and officials training against gas-attack"
Italy practices air-defense: Spreading anti-poison-gas chemicals about the defense ministry after the secret sham air-attack on Rome. 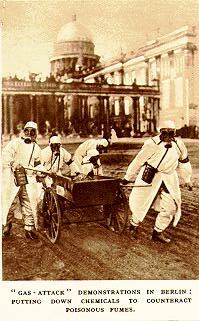 "Gas-attack" Demonstration in Berlin: Putting down chemicals to counteract poisonous fumes. "Normally, we go into a country that's in some fatal stage. We work with those who are with us, and shoot those who are not. The part that's missing here is that you can't shoot the Coastal Commission," -- Marine Col. Gary W. Anderson, describing the difficulties of staging a mock invasion of Oakland CA.